3"-6" Lines. For cart and trailer jetters. Now standard with carbide buttons for longer head life. 4"- 8" Lines. For trailer jetters. Sold with a 2ft. whip hose standard. Also jointed and rigid models, plus inlet options. 6"- 18" Lines. 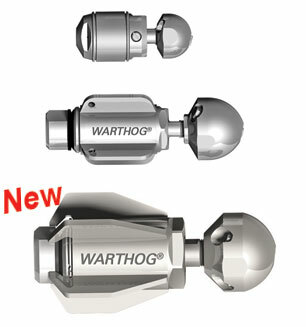 A real workhouse with 1/2" and 3/4" inlet options, both inlets available in NPT or BSPP. 6"- 18" Lines. 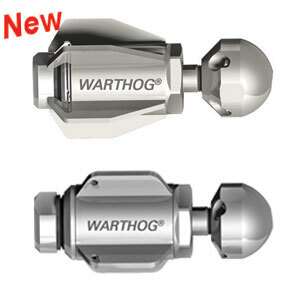 New Maximum Puller WHP-3/4™. Designed for more pulling power. 8"- 36" Lines. WG-1 Classic™ and the new Maximum Puller WGP-1™. Designed for more pulling power. 8"- 36" Lines. For Municipal jetters. This is a High flow model with up to 120gpm (450 lpm) flows.